Hello lads, it's been a while! As you probably know, a new mappack is in preparation by Endromede & BK Team, and we also want to use this opportunity to revise some maps from the 1st map pack that could actually be improved, some for optimisation, some others for sector layout, some for both. See the Map pack topic in Announcements section for a list of these. I try to get in touch with original map makers of this map, because i dont like touching someone else's work without having his authorisation. This great map suffers from a very low framerate, and its very sad because the map is awesome..
Fortunatly in this case, it is possible to fix it, despite it's not that simple: I will explain in this topic what will change, and why. this topic can be used as help for anyone who wants to optimise another map. Here are the temporary new VP positions ingame, all 3 are set to offer equivalent spawn-to-VP distance from both sides. I also took consideration of the area arround, with the best spot i could find at equal distance that give enough space to fight and manoever. That is for the Gameplay part for now. For now I have no changes planned regarding sector's repartition, but if you are used to play in PvP and have some suggestion, feel free to post em here. My next post(s) will cover optimisation part(s), and it will be quite longer. Last edited by Playmobill on 01 Oct 2016, 20:42, edited 14 times in total. I will often refers to 'Renders' in this topic, it is because that is the statgraph value i use most to guesstimate optimisation in a specific area. Something to know about CoH map making, is that this value can be used to see critical area very quickly. In this example, the value here is 183. For a 3vs3 map this value is very very good, so this specific area will not cause lags. Try as much as you can to stay lower than the following limits if you want to be sure to avoid critical areas for CoH engine, especialy if the area will see some battle. Stay bellow those limits as much as you can, especialy for area that will see a lot of combats. Unfortunatly, in a lot of area in this map, we go far beyond the limits in renders(). One of my tasks here will be to make everything possible to lower renders in combat areas to descent values. Layout and map design is very good so i don't plan to touch those 2 aspects, especialy since there is already a lot of people that worked on this map. So when we see in some 3v3 or 4v4 maps, with certain combat area showing 800+ renders, you can easily understand why CoH engine just give up and will tell you to GTFO with your 15 fps max in battle, despite your warmachine PC. This also apply for certain Solo maps conversion to MP: those maps were originaly designed with a different render() limit in mind! The 1st thing i noticed and that was confirmed in editor, is the amount objects that were sometime barely visible. I started to remove the multiples hidden (or nearly) sandbags or debris for examples, to reduce the number of objects per screen, to save some renders. by doing that arround the church, we went from 600+ renders to a more acceptable 350 renders. Rumbles. In the urban area of the map, lets say that 1/3 of small debris objects are not visible or so few that we can remove em and sometimes move a little bit the one next to it to occupy the same visual space. There is also some Debris Mounts splats in coh library that can be used to fil some holes in critical area. Trenches. There is a ton of additionnal sandbags objects used to look good, it does look great, but the problem is that trench walls (like every wall in the game) are already extremely costy for renders(). 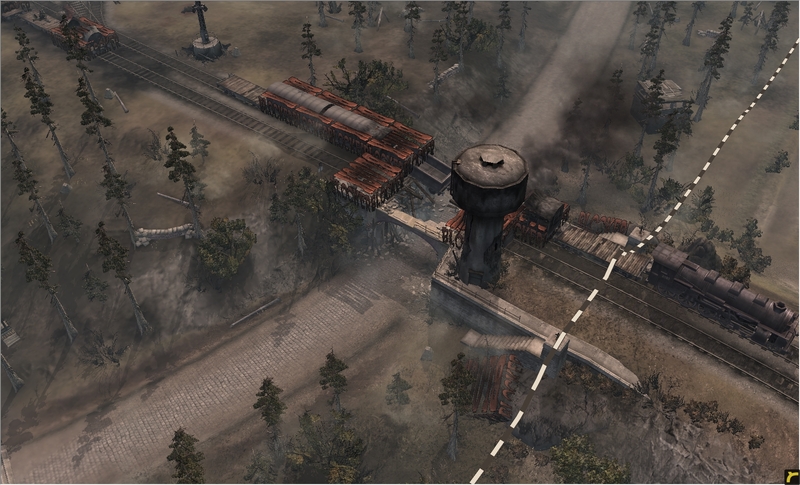 having a lot of long walls in the same area is not good in CoH engine. Trenches make no exception, so we have to remove as much additionnal objects as we can without affecting gameplay or overall trench design..
Sandbags. A lot of them where completly invisible under other sandbags, removed those without mercy. For those barely visible and stacked with other sandbags, I removed the most hiddens, and modified position of the remaining sandbags objects to fill the holes and look the same as before, as much as possible. So far i did that on.. lets say half of the total trenches. We should go over all of it. Trees. As you probably know, maps full of tree in CoH or BK = laggy map. So i will do my best to reduce tree number in dense pine forests, to look as close as possible but idealy i want to loose 1/3 or 1/4 tree on those pine forests.. So the job here will be to select which pine to remove without affecting the visual. So far i only removed a couple of trees, i will do that in last. Bushes. Usualy this is not really causing lags in Coh maps, but near Axis spawn there is a huge double line of bushes that is too close to the trenches. Because trenches are so hard to optimise, i had to reduce drasticly the number of bushes there too, taking care of removing those that were less important. for visual and gameplay. Splats are some textures item that you can drop on the ground, it will overlap ground textures Tiles. it doesnt lag, and sometimes it looks nearly the same as if you used an object (that cost renders). For example, there is some dirt and mud splats that are very often used, but also some impacts and craters, and there is a ton of splats to help you to gain FPS and have a fancy map. In La Chaudiere case, i will only use some Rumble splats to fil certain holes where i was forces to remove rumble models to save some renders. 2nd thing that got my attention was the water sources. Once in editor i counted 40+ sources in the map, including those in OoB (most of em where in OoB). But still, this is way too high. Something to know about water sources in CoH engine, is that they multiply calculation of objects arround the water source(s) displayed on screen, because of the reflection of course. So when you place any water source in combat area, you will have to keep the amount of surrounding objects as low as possible, because each of them will be calculated twice, even those who are not reflected. (it is again multiplyed if multiple water sources are present in the same screen area). So when you place like 3 water sources in the bottom of a trench, with a lot of trench walls and sandbags arround, you basicaly create a nightmare for the engine. For water sources in OoB, it is way less impacting, as there won't be any playable units reflected and players will most likely never look there during battle. However 40+ was too high, so for example in OoB, I regrouped each 4-5 mini ponds into a bigger pond. Same amount of water, looks a little bit different but it's 5 times cheaper. For trenches, i had to take drastic mesures as it's in a combat area: deletion of all trenche's water sources, as this kind of trenches by themselves are already one of the biggest source of lags in maps (i detailled above why). Fortunatly, we can use a trick to simulate water in a trench, a ditch texture that fit very nicely to this purpose.. Once manipulated and once the 'flooded' terrain flattered, we can apply a spline texture that looks similar to the water source, but for no engine cost at all. So, for now, I removed/converted to texture all in-map water sources except for the lake.. And reduce OoB water sources to its minimum. Let's compare to an other map where the issue also forced me to remove water: Why do you think i had to remove the 5 water sources that I used in earlier betas of Berlin 1945? It was reflecting all surrounding buildings and was makin the map lag! So now you know exactly why the Spree is dry in the original Berlin 1945 map that will be in the next map pack. In TILE tool, hit both 'Layer Count' and 'Chunks' buttons. The following screenshot, took after the 1st step of tile optimisation, show some red and green numbers in a grid. Numbers displays how many different tiles are used on each chunk. The color is there for a reason: red is bad! In La Chaudiere case, i applied 2 steps of Tile optimisation. Originaly it had 8 different Tiles textures, and numbers where nearly all red, with some area with high values (certain parts had all 8 tiles on it). This is bad for optimisation ofc. To make my job easier (and faster) i choosed to delete 2 Tiles sets on the 8 total: but i choosed very carefuly. 1st thing to take care of was to know which 2 sets where the less important to the map, and the less used. there was 2 different grass sets, and the map design could be very much using only one, so i know that one of those 2 grass sets had to say goodbye. At the left of each Tiles set, there is a Tickbox that will display which area use this Tileset, by overlapping the color next to the tickbox (grey by default). Change this color to something flashy, tick the box, and you can now see how much this texture is used. Thats how i choosed the less used grass texture. Fortunatly the default tile was the other kind of Grass: when you delete a tilee, the area where this tile was painted will be filled by default tile (the very first you have in you map when its blank). So when i removed the less used grass tile, all areas that where painted with it were automaticaly painted with the other grass. handy. I noticed after that there was 2 sets of Dirt tiles: but one was used only on a tiny part of the map. All other tiles where too important or covered too much area to be removed. As my default tile is grass, i dont want that muddy Dirt tile to be replace by some grass. So i Ticked the tickbox and selected flashy color for display. I took a couple of muddy splats and placed em over all areas where this Muddy Tile was used. Splats will look nearly identical, and its only on a small area of the map anyway. By seelcting a certain Tile set, then clicking the 'eraser' icon button, and then left click on a chunk, we remove the selected Tile set from all the chunk square. So play with tiles set tickbox to see where some tiles are not visible (or nearly), and erase this tile from this chunk. Sometimes a single pixel painted with 1% of the Tile set per an chunk area, is enough to count one more tile per chunk, despite its absolutly not visible that this tile is painted there. but coh engine doesnt care, he considers that you will have to load all those tile sets to display that specific area. Thats is how and why reducing tiles per chunk is important. So far, on La Chaudiere, i will stick to the 6 tiles i kept, I reduced a lot of tiles per chunk, but i have to continue to reduce tiles per chunk to have no area above 4. Green (3) is the best, but for some area its not possible to have only 3 tiles per chunk. haha, uncovered.. yet. But as its quite a huge part, i will later write here a description of various methods and tricks i use for ground optimisation. Thats it for now, stay tunned for more optimisation blabla! Last edited by Playmobill on 01 Oct 2016, 20:53, edited 12 times in total. - and applyed some text formating to make it easier to read. I realized that optimisation for CoH is badly covered on internet, and the few links i had in the past are dead since long time. most of this can be applyed to Coh² btw. So i choosed to describe the process for La Chaudiere, as with this great original map, we can covers a lot of optimisations aspects. I will gradualy expand some explanations and complete this topic while proceeding in La Chaudiere. SOO happy b/c this has always been one of my favorite bk maps, but from what i remember just before community patching began it was pretty buggy and crashed 90% of the time. Very glad to see a revision is in progress. Could you please make the same with Road to Cherbourg? Its a great map, but huge ammo income ruins all gameplay and all matches end up with arty spam there ( each side can gain almost +100 ammo per min when points are OPed ). Also the biggest fuel point is located not exactly at the middle of the map, but closer to axis side, thats another thing which causes imbalance. Sukin-kot (SVT) wrote: Could you please make the same with Road to Cherbourg? Its a great map, but huge ammo income ruins all gameplay and all matches end up with arty spam there ( each side can gain almost +100 ammo per min when points are OPed ). Also the biggest fuel point is located not exactly at the middle of the map, but closer to axis side, thats another thing which causes imbalance. That all sounds and looks great. Thx to playmobil (and all who worked/working on it). When i am looking on that map road to cherbourgh i notice once again that each side has the two most important ammo points located next to each other. That means that these areas are likely those where they put up heavy defenses which means that each team camps arround one area. I wanna ask if we might stretch the larger ammo points more across the map? For example the 10 ammo point on axis side next to that hill would switch with the 5 ammo point in front of the church (opposed to the current major allied ammo point). Meanwhile the major allied ammo point in the center or the one next to the street would swap to the other side opposed to the axis ammo hill. Other constellations could be that axis ammo near the street with that important ammo point moves south to the allied side while the allied 10 ammo point in the center moves to that church on axis side. Also as you can see the fuel points are arround the bases and thus save so far for each side. Just one in the center. The ammo points are at the frontline. The ammo points marking usually the often very static frontline. And once one side achieved a major push against one major ammo point it then often marks the beginning of the end for the other side. So maybe you can stretch the important ammo points more accross the map while also brining some fuel points closer to the contested areas of the map. That way it wouldnt be so easy to set up extremly large defenses and mortars arround one extremly important area. And pushes followed by counterpushes elsewhere would become more frequently and important. There are many other possible constellations. Maybe there can be two medium fuel points closer to the frontline? idk, but i think you guys got my toughts. Just stretching important res points so that the one team cant defend his 2-3 major points with a handfull units and rewarding quick reaction, team actions and counter pushes elsewhere. So the mid game and vehicle stage becomes also more important which is currently focused on establishing strong defenses to be then bombed by arty. This said, i agree that those 2x2 ammo points at the very center could be switch (+10 with +5 next to it) to offer an iterresting gameplay variation. For the fuel, However its a little bit more complicated. We'll see with Endro what is possible on this. Also i realise that the map has too much fuel too. a solution might be to replace the +9 fuels from each side by +4, to let the only remaining +9 at center, or to remove one or the +4 next to each base... We'll see what the best solution. I was also thinking about replacing two +10 ammo points with two 9 fuel points. Each ammo point next to a street would seem most suited. The fuel in the corner would become small fuel points or ammo. The center would be a 10 ammo point. So there would be three medium ammo and two medium fuel points in combat areas. Imagine you see the the map from the south, or where allied start. The 10 ammo point left would be a 9 fuel point. Street center a 10 ammo point. Center (allied hill) a 10 ammo point. The 10 ammo point near the right street would be a 9 fuel point. The axis hill remains as 10 ammo point. And idk if there would be a fourth 10 ammo point on the map. Hi all, I've two points about two old maps. - make the bridge near axis base on LaFiere undestructible because when it is destroyed it's a very big disadvantage for the axis team who has to pass through the small river down the hill (expecially with heavy tanks); it is also a easy target for arty and it is the only bridge of the map. I will talk with Endro about that... If possible, then I think it can be done. Paso95 wrote: Hi all, I've two points about two old maps. But Autry.. i really like it without any base AA turrets at all... There is going to be a 2nd version of Autry as I already said though! its better to have 2x AA emplacement or you will be raped early in game with light armored cars & tanks. i have been working this week on LaFiere, but La Chaudiere revision is still going on ! Most of the work is optimisation without changing much the visual feeling, but here is some pics of area that have really changed. The top right corner in this picture isn't done yet, it will be an infantry only acces, just like the stairs. All bunkers are gone. and a lot of objects gone in this area too. It was the part of the map that had the biggest fps issues. I'll expensively descriptive, because its also the purpose of this topic. as you probably know, there is no model that allow to go under, so in this case, we have to build a bridge from scratch, with a little bit of everything as components. Walls on each side of bridges are made of Support walls. All debris (stone and wooden) use a little trick, to remove hitbox: create em out of bound, then stamp em, and paste the stamp inside the map. no more hitbox. Wooden beams use Wooden vertical beams debris model, without hitbox, and aligned the closest i could tohorizontal. for those still in place inside the bridge. Wooden planks on top are from the base or defense section, i dont remember, but its supposed to be the wooden planks you can find in front of HQ's entrance, they don't block walking. Broken fences are just a regular fence spline, broken with 'wall destroyed' edit, and set to the correct elevation so they look like they are part of the bridge. 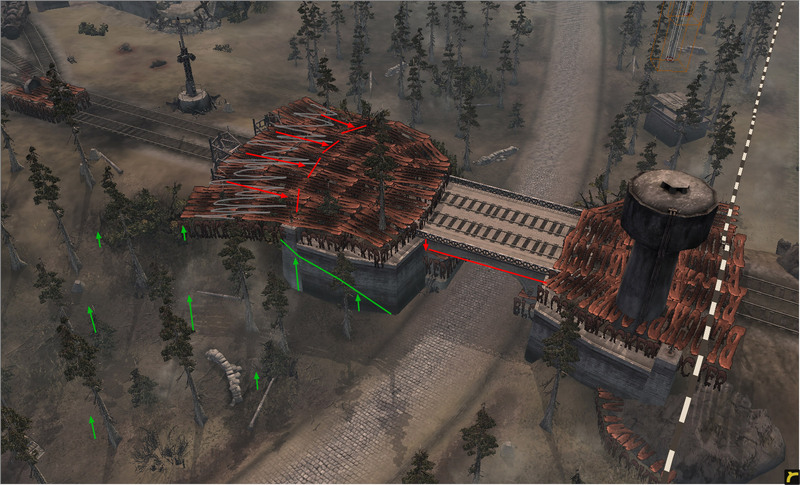 The idea was the following: as you have to be able to go under, you can't just use a normal CoH bridge (which can only be walked ON, not under), or at least with a hitbox. Problem with the old bridge model, a regular bridge without hitbox (with a hitbox, it would have been impossible to go under), was that artillery shells could go through it without damaging it, nothing could damage it, and that was really looking weird while in battle. Also the surrounding area had a very different elevation, and a big part was blocked by Shotblockers, to prevent any weird JFK-like AT shell trajectory. I changed the elevation of the surrounding area to prevent that, and i openned 90% of the blocked area, using the new destroyed train as an excuse to place shot blockers in the wagons, so AT shells cannot bend over the most angled areas or the bridge's surrounding. In this one, you can see the new bridge and new train, with the new Shot Blockers unmasked. Sorry for my poor english, but i hope you get the idea. Last edited by Playmobill on 15 Jan 2017, 20:37, edited 2 times in total. Just remember guys that all new maps for bk, they needs the base AA's x2. Should i add 2 in autry too ? not sure it has 2x AA on each spawn on autry. The new maps are going to include a new version of Autry as you all know.. atm I am not sure either if it does have 2x AA around each base or not... However, if it doesn't have; then I believe it should have! But my personal opinion would be to keep the old Autry (which is the current one) as it is, without AA at all. As it's confirmed now, the new version of Autry in fact doesn't have any AA turrets at all currently.. but they will be added!